If yesterday’s post was any indication, I’m not ready to give up my white jeans! As someone quoted to me yesterday on Twitter, if the Pope can wear white after labor day, so can WE! I kid, I kid. But I am serious about styling white denim all year round! 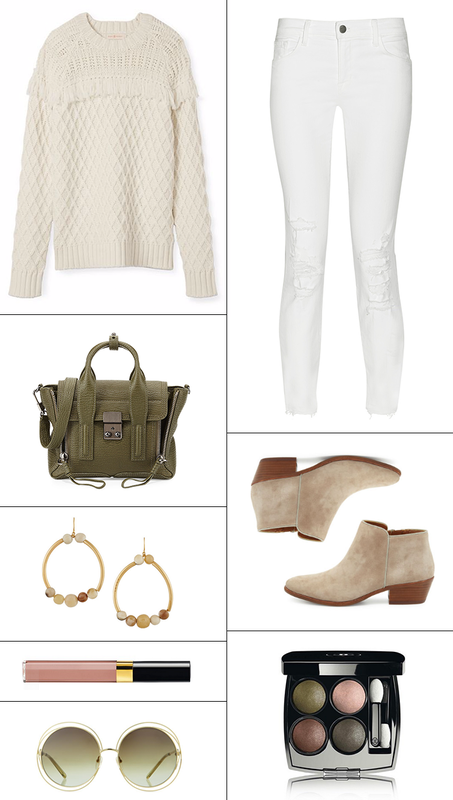 How would you style your favorite whites in winter? I thought I was over wanting the pashli bag until i saw it in green, its soooo perfecxt for fall! Cozy looking textured sweater, which would pair perfectly with those white jeans! Love the texture on that sweater and the light color palette. I bought a similar pair of booties for my trip to Paris in the spring and it was the best purchase I made- love the little heel yet they’re still so comfy! Love the touch of fringe on that sweater! And love the PL bag!